You are cordially invited to the opening of An Identity Crises: Images of Dissent at Reed, 1966-1972. Located across from the reference desk. Light refreshments will be served. Like any institution, Reed College has always been shaped by the individuals who care about it most. Founded out of Progressive Era ideals, Reed’s early years were fueled by a desire to reject the status quo of other institutions. This Reedie way of life, however, was not always interpreted in the same way. 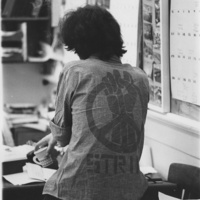 In the 1960s Reed was beginning to undergo an ideological schism between the Old Guard, Reed’s established faculty and administrators, and the Young Turks, the younger, often un-tenured faculty. This exhibit and corresponding website uses items from the college archives to give an overview of Reed's identity crisis and the global issues which pitted the young thinkers against the status quo. The exhibit runs from December 8th 2017- February 1st, 2018. Curated by Emily Jane Clark, Social Justice Exhibits and Research Intern. See the online exhibit here.